Could your criminal conviction be enhanced by California’s Three Strikes Law? Passed by California voters in 1994 under the guise of Proposition 184, the California Three Strikes Law is designed to significantly increase the prison sentence of repeat offenders who are convicted of a subsequent felony offense. However, in November 2012, Proposition 36 was passed by the California voters to revise the California Three Strikes Law and impose life sentence only on those individuals convicted of a new serious or violent felony. The term “strike” refers to a previous felony conviction that qualifies as a serious or violent felony under California Penal Code sections 1192.7(c) and 667.5. If you have a prior felony strike conviction on your record, your sentence for any subsequent felony conviction is doubled if your subsequent felony is considered a strike-able offense, meaning it is a serious or violent felony conviction. If you have two prior felony strike convictions on your record, your sentence for any subsequent serious or violent felony conviction is punishable by 25 years to life. See California Penal Code 667(e)(2). In order for the sentencing enhancements of the California Three Strikes Law to affect your current criminal charge, the prosecution must prove that you were convicted of a prior strike. For prior adult convictions, the prosecution will submit your record of conviction for the court to examine. For prior juvenile convictions, the prosecution will submit your sustained juvenile petition (the juvenile equivalent of a record of conviction). The prosecution can also use booking photos, fingerprints, or any other evidence that show you are the person named in the record of conviction. Under California Penal Code 667 PC, your sentencing and punishment for the California Three Strikes law depends on how many prior strike convictions are on your record. If you have a prior felony strike on your record and you are convicted of any subsequent felony, your base sentence for the current offense will be doubled. If you have had at least two prior serious or violent felony convictions and you are later convicted of any kind of felony, you face a minimum of 25 years or 3 times the sentencing term for the current felony conviction, and a maximum term of life in prison. Can I have multiple strikes from a single previous case? How will the prosecution try and prove a prior strike? If I am convicted under California’s Three Strikes Law, can I become eligible for parole? Where Can I Find the Criminal Defense Attorneys with the Most Experience in California Three Strikes Law? If you are confronted with accusations of a felony strike offense, it is essential that you contact a California criminal defense lawyer at Wallin & Klarich who is knowledgeable and experienced with the California Three Strikes Law under California Penal Code 667 PC. Our team is ready to fight for you. Call today for your free phone consultation. 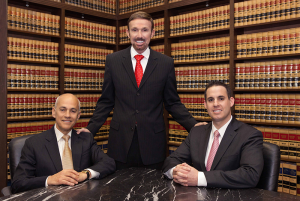 With offices in Orange County, Los Angeles, San Diego, Riverside, San Bernardino, Ventura, West Covina and Victorville, Wallin & Klarich has successfully represented clients facing prosecution for serious or violent felonies for over 30 years. We have the knowledge and the know-how to win your case. We will get through this together. Call us today at (877) 4-NO-JAIL or fill out our confidential form. We will be there when you call.